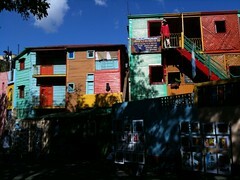 Going to La Boca is one of those things you have to do when in Buenos Aires. But it's not super convenient via public transportation. Fortunately, Boca along with a couple of other areas (Puerto Madero's Ecological Reserve, for example) is reachable via the Buenos Aires Bus, similar to the Mexico City Turibus I enjoyed last year. Yes, it's touristy and kinda cheesy. And no, it's not cute when porteños on the street point and giggle. But these buses provide a quick and affordable way for people who are here for only a short time to take the must-take photos and see the must-see sights -- and for those here for longer periods to revisit some of the areas they didn't get enough of. Even in your home city it would probably be fun to hop on one of these bad boys and take a spin. Back to La Boca, it's definitely cute but it's also definitely not worth more than a relatively quick walk-through. I did, however, greatly enjoy going back to Puerto Madero. I don't care how different it is from the rest of the center of the city. Just like I love SF's South Beach, I love the modernity of Puerto Madero. And, really, for a city on the water you have so few opportunities to actually see any of it. For that alone, PM delivers.